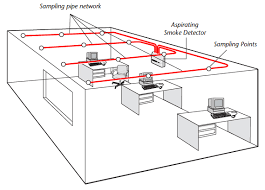 An aspirating smoke detection (ASD) system comprises a central detection unit, which draws in air through a network of pipes to detect the presence of smoke particles suspended in the air. The system is extremely sensitive and can typically detect smoke before it is visible to the naked eye. ASD systems are therefore suitable for environments where a highly sensitive rapid smoke detection capability is required, such as clean rooms, server rooms, rooms containing highly flammable substances etc. An ASD system can also be used as an alternative to a conventional fire detection system, where heat and smoke detectors are considered unattractive or where there is a possibility that they may be tampered with. Conventional ceiling mounted detectors may also activate too late – if smoke does not reach them quickly enough. Having attained significant experience in the design, installation and maintenance of ASD systems, we can deliver a bespoke solution to fulfil you exact requirements.